Stylists at the St. John Knits boutique in Charleston are at your service to help you discover the St. John wardrobe that suits every part of your lifestyle. Whether you’re dressing for a luncheon or finding that perfect wedding look, the Charleston boutique wardrobe specialists are there to give you the completely personal and luxury shopping experience St. John is known for. We also offer a suite of additional client services including alterations, free delivery within the downtown Charleston area and one-on-one fit and style consultation. Please inquire for more information with the boutique at 843-577-5888. At the heart of Historic Downtown Charleston and steps away from famed King Street, clients know they can rely on Charleston St. John Knits for their wardrobing needs every day of the week. Located at 124 Market Street in the Belmond Charleston Place, the shopping center offers a juxtaposition of old-world charm with innovative and leading-edge spas, cuisine and shopping. The level of personal service and impeccable attention to detail at the boutique is matched only by our hand crafted collections including jackets, dresses, gowns, athleisure, evening, workwear, and vacation-ready styles. Wardrobe specialist are always willing to go above and beyond to work with clients, even booking appointments before and after store hours. We practice craft and couture. With iconic American design and signature knits, we invite you to experience first-hand, the meticulous details, craftsmanship, and one of a kind embellishments that have become synonymous with St. John Knits. 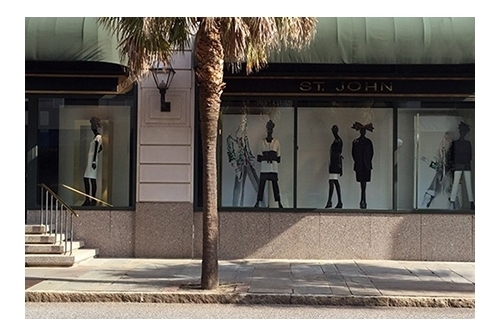 Visit us at the St. John Knits Charleston boutique and we will personally guide you through the range of St. John collections to see the effortless, alluring and refined clothing that has appealed to women all over the world since 1962.